Who am I? Why am I here? What happens when I die? These are the greatest of all mysteries. The Bible’s surprising answers show how humans will really enter the spirit world. Albert Einstein is considered one of the most brilliant thinkers of the 20th century. He was once asked about his brilliance, and he explained that it wasn’t that he was so smart, but that he was curious and asked a lot of questions. If someone asked you to explain the purpose of man, what questions would you ask? If you can correctly answer these three questions, you will have solved the greatest of all mysteries. What does God tell us about our future? If you look at the Bible and solely the Bible, you’ll find a different answer than you get from religion. Since Protestantism involves many different denominations, there are different ideas about what happens when you die. But, in general, Protestants only differ from Catholics in their rejection of purgatory. They also believe in an immortal soul that at death either goes to heaven for eternal bliss or to hell for eternal punishment. Most eastern religions—Hinduism, Buddhism and others—embrace the concept of reincarnation. This is the belief that when you die, your immortal soul lives on here on earth in a different form. This new form may be human, or it may be an animal or even an insect. Then there is the atheist view. Atheists do not believe in an afterlife. They believe this life is all there is. But they believe mankind will continue to evolve and things will get better. One well-known atheist, Richard Dawkins, concludes that religion is nothing more than a useless, and sometimes dangerous, evolutionary accident. He is joined in this view by other best-selling atheists, such as Sam Harris, who wrote The End of Faith, and Daniel Dennett, a philosopher at Tufts University, who wrote Breaking the Spell. These contradictory human answers can’t all be right. Are any of them correct? According to the Bible, man is composed of spirit, soul and body (1 Thessalonians 5:23). The body is the physical shell in which he lives. The breath of life added to the physical body makes a living soul (Genesis 2:7, King James Version). And the spirit (1 Corinthians 2:11) comes from God Himself. This “spirit in man” isn’t a separate person, nor is it an immortal soul. It cannot function on its own. It needs a living body to interact with. This spirit in man returns to God at death (Ecclesiastes 12:7), making possible a resurrection. This second question is equally important. We find in Scripture that humans were created by God, and they were created after the God kind. By that, we mean man was created in the image of God, but not of the substance of God. Man is flesh and blood and not spirit. He was not created after the animal kind, as we read about in Genesis 1. “Then God said, ‘Let Us make man in Our image, according to Our likeness; let them have dominion over the fish of the sea, over the birds of the air, and over the cattle, over all the earth and over every creeping thing that creeps on the earth’” (Genesis 1:26). And in Genesis 2:7, “And the LORD God formed man of the dust of the ground, and breathed into his nostrils the breath of life; and man became a living soul” (King James Version). We see that man was not given an immortal soul. He is, in fact, a soul, a living soul that is subject to death (Ezekiel 18:4). Man was created with the potential to become a spirit being and a child of God. Man was created with the potential to become a spirit being and a child of God. Paul writes in Ephesians: “For this reason I bow my knees to the Father of our Lord Jesus Christ, from whom the whole family in heaven and earth is named” (Ephesians 3:14-15; see also Hebrews 2:9-11). Paul, in writing to Timothy, declares: “I write so that you may know how you ought to conduct yourself in the house of God, which is the church of the living God, the pillar and ground of the truth” (1 Timothy 3:15). The Greek word translated “house” here is oikos, which means “the inmates of a house, all the persons forming one family, a household” (Thayer’s Greek-English Lexicon). The amazing future of mankind is to become part of this family of God, of which the Church is a physical representation. Now we get to the final question. Scripture speaks of a resurrection from the dead. “So also is the resurrection of the dead. The body is sown in corruption, it is raised in incorruption. It is sown in dishonor, it is raised in glory. It is sown in weakness, it is raised in power. It is sown a natural body, it is raised a spiritual body” (1 Corinthians 15:42-44). This is our human potential—to be born into a family of spirit sons and daughters of God (2 Corinthians 6:18) through the resurrection from the dead. Man was created physical, of the dust of the ground. God breathed into him the breath of life and man became a “living soul.” As a living soul, he is also capable of dying; in fact, he will die. He also has a “spirit in man” that makes him different from any animal and gives him the potential for eternal life as a spirit being in the family of God. When a man dies, his body decays, but his spirit returns to God. This spirit is incapable of independent action or independent thought. It works with the human mind to give man the ability to reason and make decisions. Animals are incapable of such reasoning ability. Once you are dead, your mind ceases to function, and you are incapable of any further action until the resurrection (Ecclesiastes 9:10). Job asked a most important question: “If a man dies, shall he live again? All the days of my hard service I will wait, till my change comes” (Job 14:14). What change? The change from mortal to immortal! When Jesus Christ returns to this earth, the spirit from those Christians who have died will be united with a new spirit body. This is called the “first resurrection” (Revelation 20:5). Since it is called the “first,” we are assured that there will be others to follow. God has a plan that will include a resurrection for everyone, but each in his own order (1 Corinthians 15:23). Albert Einstein was on to something when he declared how important it is to find the correct question. If you don’t know the correct question, you will most likely not find the right answer. 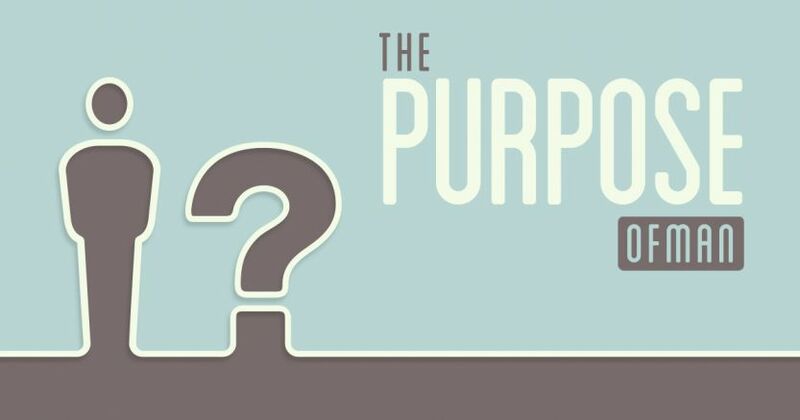 The purpose of man is embodied in the answers to three questions: Who am I? Why am I here? What happens when I die? We don’t have to speculate or wonder about the answers. They are right in front of us; all we have to do is read them. Most people have no clear idea what the purpose of man really is, and they have no clear understanding of what happens after death. The Bible spells it out clearly. The purpose for man—the very reason for our creation—is to become spirit beings in the family of God. In a world of great darkness, death and decay, eternal life as a spirit being is our only real hope. For more on this subject, see the articles in the “What Is the Meaning of Life?” section of Life, Hope & Truth.